The Trifid Nebula, also known as Messier 20, is located over 5000 light years away in the constellation Sagittarius in a stellar nursery, a star forming region of the Scutum arm of the Milky Way. It is a combination of an open cluster of stars that surround a rare O type star, emission and reflection nebula, and absorption nebula which form the dark bands of of interstellar dust that block the light, that help to give the Trifid Nebula’s three-part recognisable structure and its name, Trifid means three lobes. 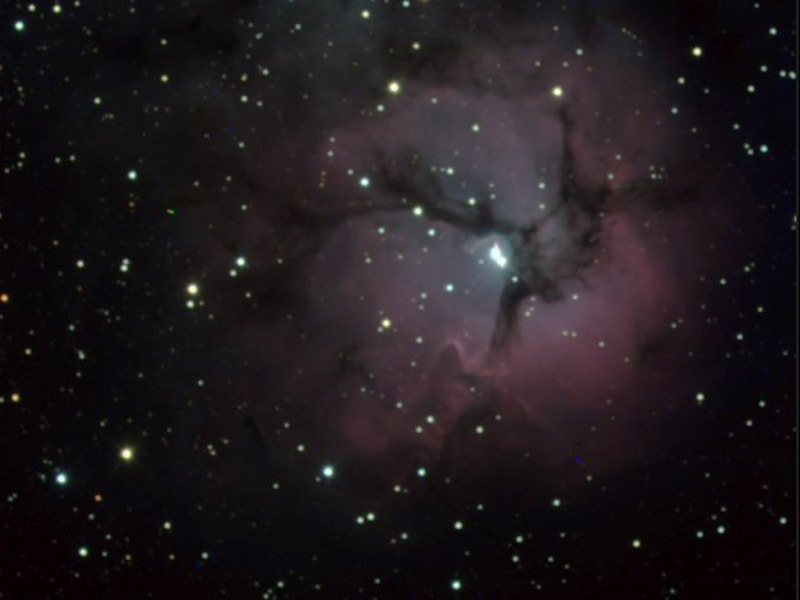 To find the Trifid Nebula, navigate by star hoping from the spout of the tip of the ‘teapot’ asterism and follow the steam, in reality, the faint glow of banding from millions of stars of the Milky Way, an edge view on to the centre of our own galaxy. This are is full of stars under binoculars, even more in a telescope, scan up and past the Lagoon Nebula (Messier 8) for a smaller, fuzzier patch to find this great summertime object. Don’t expect to see any colour, maybe a tinge of green, as with most astronomical objects, colours are only obtained through long exposures which your eyes cannot do but cameras can. This image was taken using the iTelescope network on a 12.5 inch RCOS, SBIG ST8 camera and comprises of 3 x 120 second red, 3 x 120 second green and 1 x 120 second blue filters. Registered in CCDStack with adjustments in Adobe Photoshop.